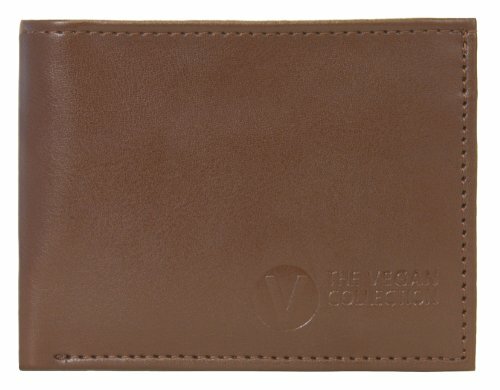 Are you looking for a vegan wallet with a coin pocket? Then you've come to the right spot. We've managed to find 10 options that will help you keep track of your spare change. Simple, elegant, practical. 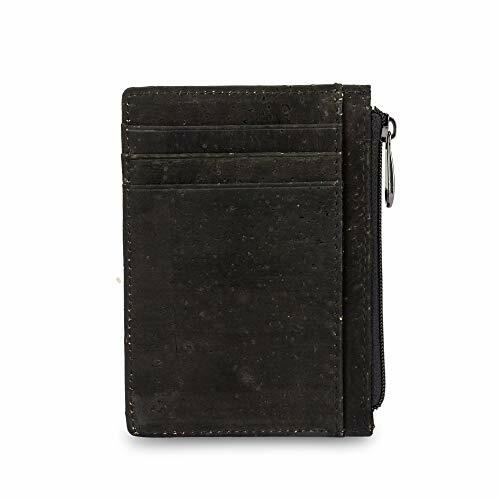 Made of black pebbled faux leather, this slender H&M wallet is compact but long enough to fit your smartphone. Zips around with a gold-toned zipper. Features a large zip coin pocket and card slots. Pros: It's a stylish wallet in any setting or season. With a zippered coin pouch extending across the length of the wallet, there's plenty of room for all your change and smaller items. Cons: We're not sure how many card slots it has. The Vegan Collection's bifold Jeffrey wallet in chocolate brown vegan micro leather comes with a snap flap coin pocket to keep your change from rattling around in your pocket. Built with three card pockets, two larger inner slip pockets and a full-length bill compartment. Stamped with the brand logo on the outer corner. Pros: The snap coin pocket is easy to use and small enough not to get cumbersome. No digging around endlessly for a quarter instead of a penny. Cons: There's limited card capacity, though that could help you clean out all those old punch cards. This sweet little wallet is square-shaped for compactness in your bag or your pocket. Made of burgundy faux leather and zips around with a metal ring zipper. Designed with a contrasting pink interior with four card slots and a coin pouch. Advertised as vegan: No, but it's polyurethane. Pros: Large wallets can be difficult to cart around. This one is nice and small, easy to slip into a a smaller clutch or even your pocket. Cons: A mini wallet isn't feasible for everyone. Round up your ear buds, phone charger and money and store it all in one convenient place with this orange zip-around travel wallet. Constructed with a zippered mesh change pouch, multiple card slots, pen loops and slip pockets. Big enough to hold your smartphone or a mini tablet. Advertised as vegan: No, but the material is polyester. Pros: This wallet makes airplane travel a cinch. Use it as carry-on or as an organizer to slip in your work bag or briefcase. Cons: It's possibly a little big for regular use. This wallet is o-r-g-a-n-i-z-e-d. The foldover flap functions as a zippered sleeve while inside you'll find another zip pouch, an ID window, six card slots and a spacious accordion pocket. Features trendy gray faux snakeskin. Closes with a snap fastener. Advertised as vegan: No. However, it's faux leather. Pros: You have your choice of where to stash your coin and cash change here. The roomy main compartment is a perfect place to keep the little necessities from your purse. Cons: While you could put your bills in the accordion pocket or either of the zippered compartments, there isn't a traditional cash pocket like you'd find in typical bifold wallets. If you like the look of cork, this men's wallet in speckled black vegan cork is designed with a sizable zip coin pouch built right into the top for speedy access. Comes with an ID window and card slots on the back. Advertised as RFID-blocking to prevent remote data theft. Pros: Slim and tasteful, this is a smart wallet for travel-heavy days that entail lots of ID showing or card retrieval. Cons: It's a bit bare-bones if you carry a fair amount of cash and cards. Looking for a petite vegan wallet with a coin pocket? 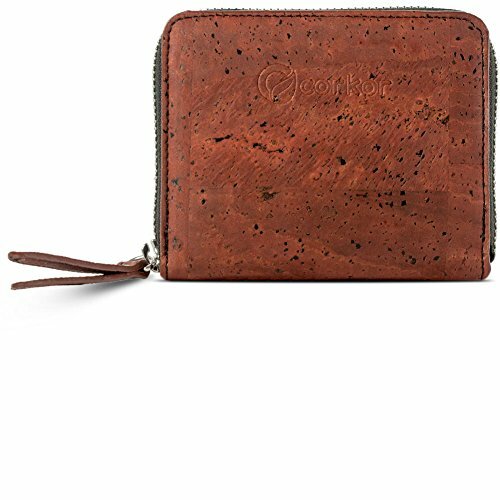 Try this hardy cork wallet in earthy reddish brown. Constructed with an inner coin pocket, card slots and a cash pocket. Pros: We love that this wallet has that beautiful cork on both the inside and outside. It's highly functional, but it's also quite luxurious-looking. 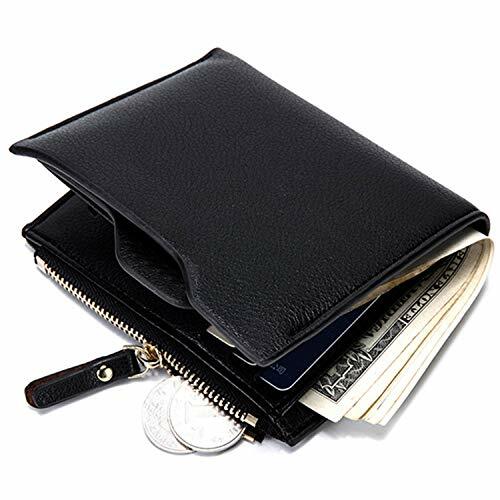 This wallet has it all: a zippered coin pocket, a bill slot, card pockets, an ID window and a removable card case. Wow. Made of black pebbled vegan leather. Pros: It may look basic on the outside, but there's a lot going on under the surface. It's got everything, and it's oh-so affordable. Cons: Really, none that stand out. Replete with credit card storage, a zippered cash and coin spot, a full-length zip pouch and two main compartments, this one is the way to go if you can't quite get everything into your current wallet. Designed in shimmery silver faux leather with a cool crushed appearance. Zips shut to keep your items secure. Advertised as vegan: No, but it's all synthetic. Pros: There's tons of room in this wallet. The more zip pockets, the better. Cons: You can store bills in either of the zippered pouches, but they may end up sharing space with your quarters. When it gets right down to it, you need a functional wallet. This red printed canvas trifold wallet has a place for your cards, cash, ID and coin change. Simple and effective. Comes with an attached key ring. Closes with a Velcro flap. Advertised as vegan: No, but it's polyester. Pros: No fuss, no muss. It's a solid wallet for an active fellow. We like the key ring for hooking up to a carabiner, your keys, or the inside of your bag so that it won't fall out while you're going about your busy day. Cons: Velcro wears out eventually.